Context: The study of gross alpha and beta radiation in environmental components and water bodies in particular is very crucial to the environmental, radiation and medical Physicist as this helps to promote good water quality and environmental hygiene. Aim: This research work understudied the radiological risk parameters due to gross alpha and beta radiations associated with three selected rivers around crude oil production sites in Abia State, Nigeria. Materials and Methods: Gross alpha and beta activities were computed for the three rivers based on analytical measurements carried out using a well-calibrated IN-20 model gas-flow proportional counter. 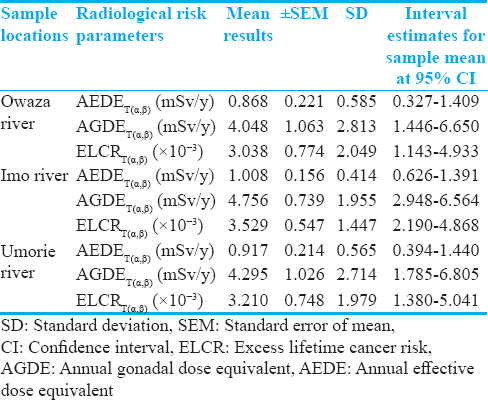 Radiological risk parameters were computed from the activity concentrations which included; annual effective dose equivalent of radiation from ingested water (AEDE), annual gonadal dose equivalent (AGDE), and excess lifetime cancer risk (ELCR). Results: The mean of the total AEDE due to the sum of alpha and beta radiations for the three rivers are 0.868 ± 0.221 mSv/y, 1.008 ± 0.156 mSv/y, and 0.917 ± 0.214 mSv/y; and are above the World Health Organization (WHO) permissible limit of 0.1 mSv/y. The mean of the total AGDE is 4.048 ± 1.063 mSv/y, 4.756 ± 0.739 mSv/y, and 4.295 ± 1.026 mSv/y; and are above the world average limit of 0.3 mSv/y. The mean of the total ELCR are (3.038 ± 0.774) × 10−3 , (3.529 ± 0.547) × 10−3 , and (3.210 ± 0.748) × 10−3 , and are above the world average limit of 0.29 × 10−3 . Conclusion: Most values of ELCR computed in this work are >6.0 × 10−4 estimated to be the risk of fatal and weighted nonfatal health conditions over a lifetime (70 years) derived from the radiation dose of 0.1 mSv/y (WHO permissible limit for drinking water). Drinking water from these surveyed sources could impact negatively on the end users. Radiological risk assessment is an estimate of an individual's probability of a fatal cancer risk as a result of exposure to low-level doses of radiation. To effectively estimate the radiological risks arising from environmental components such as air, soil and water, certain radiological risk parameters ought to be computed. This research work is anchored on the computation and assessment of some radiological risk parameters associated with some oil producing communities in Abia State, Nigeria to account for the contribution of alpha and beta particles to the probability of exposure of their inhabitants to the risk of developing cancer during their lifetime. This practice will help to promote radiation protection. The oil wells in the surveyed area belong to the Eastern Division of Shell Petroleum Development Company, and they contribute about 5% of the total barrels of oil per day produced in the division. 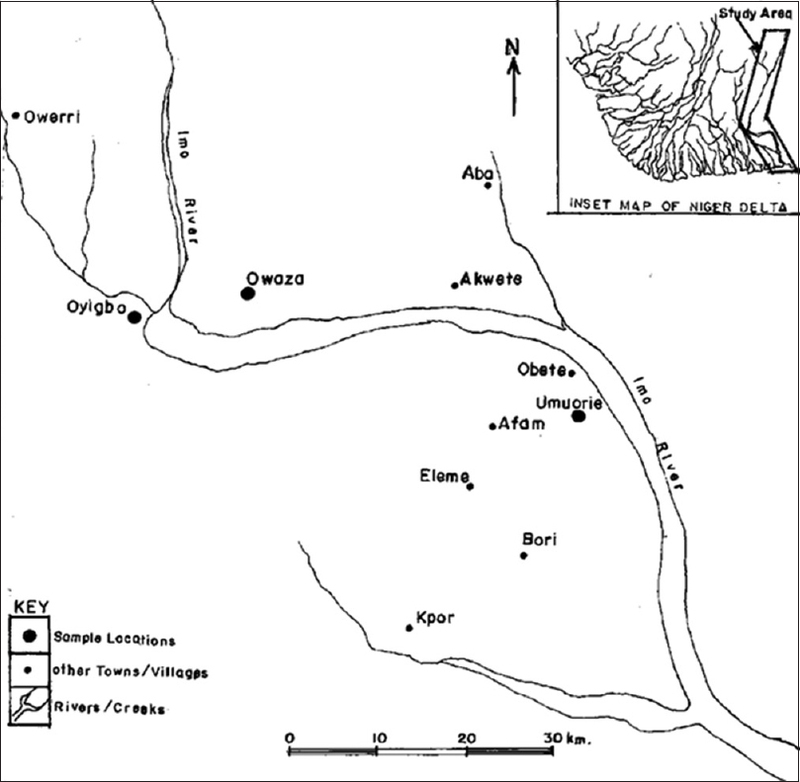 Map showing this study area is presented in [Figure 1]. where C(α,β) = the count rate (cpm) of the alpha or beta particle, R(α,β) = raw count of the alpha or beta particle, t = counting time (2700 s). S v = Sample volume (litre). where A(α,β) is the activity concentrations of gross alpha and gross beta in Bq/L, WC is the water consumed by a person in a year (We have assumed that standard water consumption for a normal adult is approximately 2 L a day which approximates to 730 L in a year)  and F1D (α,β) is the activity to dose ingestion conversion factor (for gross alpha and beta radiations). All the data analyses were performed using MINITAB (Release 14) statistical software (manufactured by Minitab Inc. with headquarters in State College, Pennsylvania, USA). We used this software in computing the sample mean (Sm ), standard error of the mean (SEM), standard deviation (σ), and t-test based on equations (9), (10), (11), and (12), respectively. where t is the t-table value for "n − 1" degrees of freedom. The results of radiological risk parameters conducted on water samples collected from three rivers around some oil producing communities in Abia State, Nigeria, due to gross alpha, gross beta, and sum of the two radiations have been presented in [Table 1], [Table 2], [Table 3]. Summary of the results of statistical analyses of radiological risk parameters for the surveyed samples has been presented in [Table 4]. Furthermore, bar charts showing the comparisons between the radiological risk parameters (due to the sum of gross alpha and beta) and the standard permissible limits have been presented in [Figure 2], [Figure 3], [Figure 4]. The correlation between risk parameters due to alpha and beta radiations have also been presented in [Figure 5], [Figure 6], [Figure 7]. 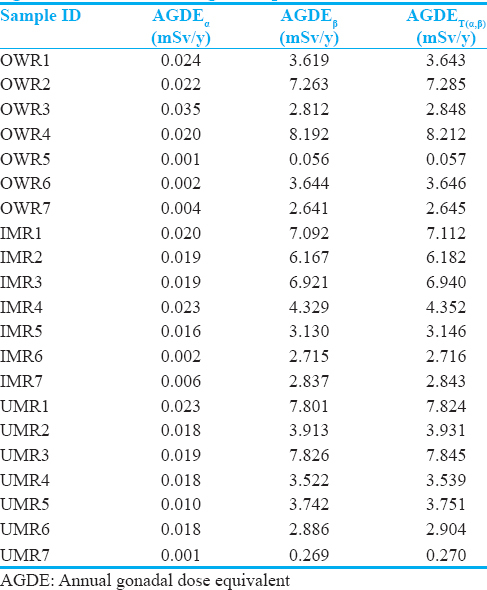 [Table 1] and [Table 4] show that the combined AEDE due to gross alpha and gross beta radiations (AEDE T[α,β] ) in water samples from Owaza River ranged between 0.015 mSv/y and 1.718 mSv/y with a mean of 0.868 ± 0.221 mSv/y and a range of Sm of 0.327-1.409 mSv/y computed at 95% CI. AEDE T(α,β) in water samples from Imo River ranged between 0.549 mSv/y and 1.5 mSv/y with a mean of 1.008 ± 0.156 mSv/y and a range of Sm of 0.626-1.391 mSv/y computed at 95% CI. AEDE T(α,β) in water samples from Umorie River ranged between 0.058 and 1.652 mSv/y with a mean of 0.917 ± 0.214 mSv/y and a range of Sm of 0.394-1.440 mSv/y computed at 95% CI. 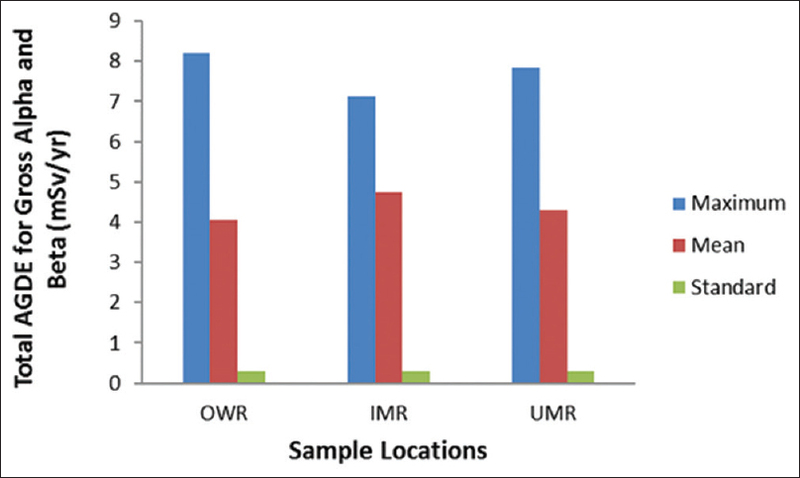 These results show that AEDE T(α,β) for most of the sampled points are higher than the permissible limit of 0.1 mSv/y,  with the exceptions of OWR5 and UMR7 whose total AEDE are 0.015 mSv/y and 0.058 mSv/y respectively. However, the mean values of AEDE T(α,β) for each of the three surveyed rivers [presented in [Table 4] are all higher than the permissible limit. These results are comparable with the results which were computed to be 0.291 and 0.728 mSv/y (for the sum of alpha and beta) for borehole and well water in mining areas of Plateau State. 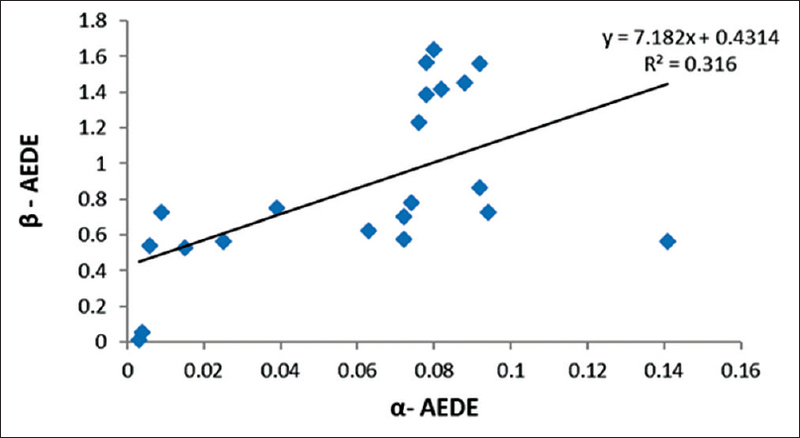 [Figure 2] shows a bar chart comparing the maximum calculated values of AEDE T(α,β) for the surveyed water samples and their mean values with permissible limit of 0.1 mSv/y. From the bar chart, the maximum and mean values are all above permissible limit. People who drink water from these rivers may likely be impacted negatively. [Table 2] and [Table 4] show that AGDE T(α,β) in water samples from Owaza River ranged between 0.057 and 8.212 mSv/y with a mean of 4.048 ± 1.063 mSv/y and a range of Sm of 1.446-6.650 mSv/y computed at 95% CI. AGDE T(α,β) in water samples from Imo River ranged between 2.716 and 7.112 mSv/y with a mean of 4.756 ± 0.739 mSv/y and a range of Sm of 2.948- 6.564 mSv/y computed at 95% CI. AGDE T(α,β) in water samples from Umorie River ranged between 0.270 and 7.845 mSv/y with a mean of 4.295 ± 1.026 mSv/y and a range of Sm of 1.785-6.805 mSv/y computed at 95% CI. The mean values of AGDE T(α,β) for each of the sampled locations presented in [Table 4] show that apart from OWR5 and UMR7, other points recorded high values of AGDE that exceeded the world average limit of 0.3 mSv/y. 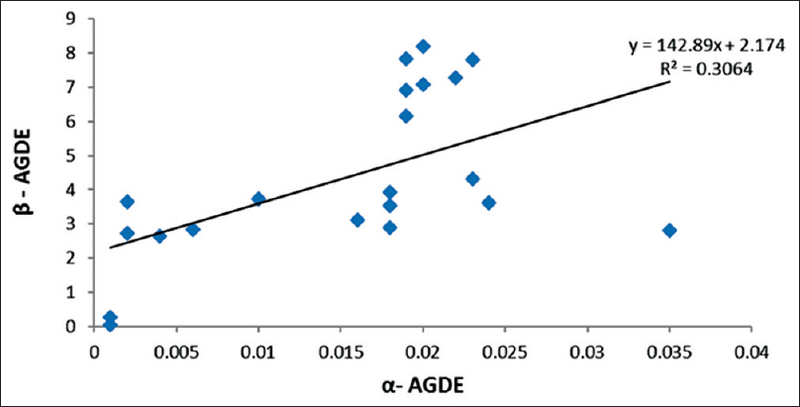 The maximum and mean values of AGDE T(α,β) compared with the standard are presented in the bar chart of [Figure 3]. These values are higher than the world standard of 0.3 mSv/y. These results imply that consumption of water from the surveyed sources could have possible negative impacts on the users. 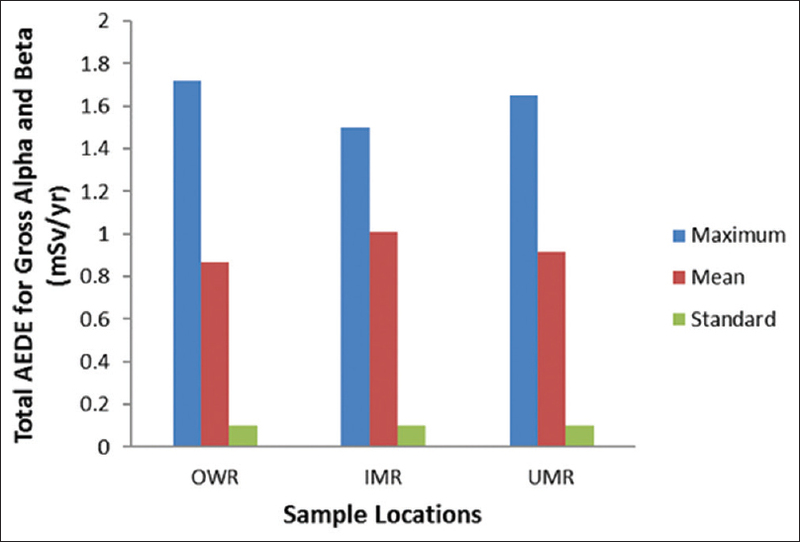 [Table 3] and [Table 4] show that ELCR T(α,β) in water samples from Owaza River ranged between 0.052 × 10−3 and 6.014 × 10−3 with a mean of (3.038 ± 0.774) × 10−3 and a range of Sm of (1.143-4.933) × 10−3 computed at 95% CI. ELCR T(α,β) in water samples from Imo River ranged between 1.922 × 10−3 and 5.251 × 10−3 with a mean of (3.529 ± 0.547) × 10−3 and a range of Sm of (2.190-4.868) × 10−3 computed at 95% CI. ELCR T(α,β) in water samples from Umorie River ranged between 0.203 × 10−3 and 5.783 × 10−3 with a mean of (3.210 ± 0.748) × 10−3 and a range of Sm of (1.380-5.041) × 10−3 computed at 95% CI. 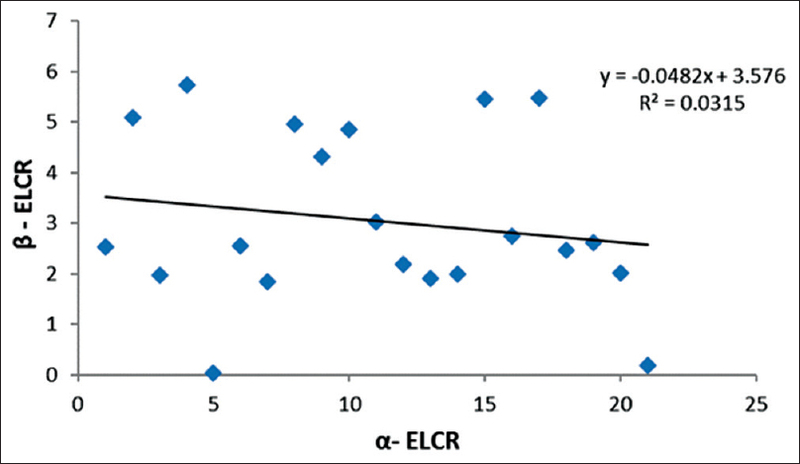 The mean values of ELCR T(α,β) for the three surveyed rivers showed higher values than the world permissible limit of 0.29 × 10−3 for ELCR due to alpha and beta rays. 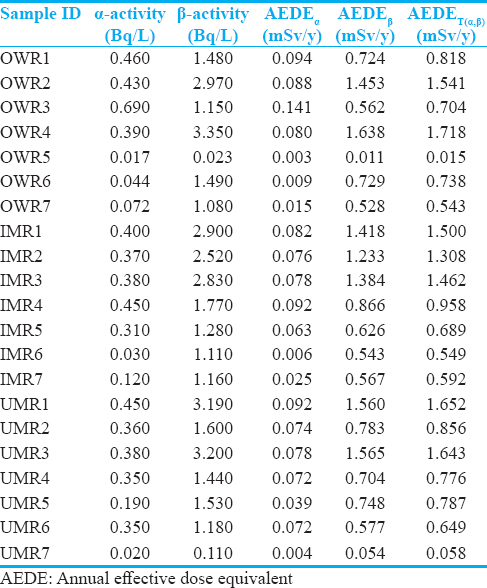 All the sampled points except OWR5 and UMR7 recorded ELCR values that are higher than the world average of 0.29 × 10−3 . Most values of ELCR computed in this work are greater than 6.0 × 10−4 estimated to be the risk of fatal and weighted nonfatal conditions over a lifetime (70 years) derived from the radiation dose of 0.1 mSv/y (which has been stated earlier as the World Health Organization [WHO] permissible limit for drinking water). Drinking water from these surveyed sources could enhance one's probability of developing fatal and nonfatal health conditions (cancer and other hereditary effects). However, let us note that studies on radiation-induced cancer at low dose rates through the use of a simple proportional relationship between increments of dose and increased risk is a positive scientific assumption but with its associated uncertainties. 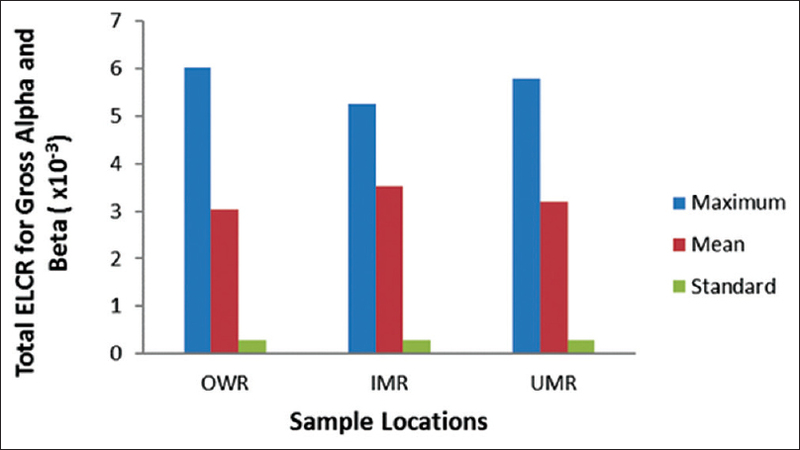 [Figure 4] compares the maximum and mean values of ELCR T(α,β) for the sample locations with the world average. 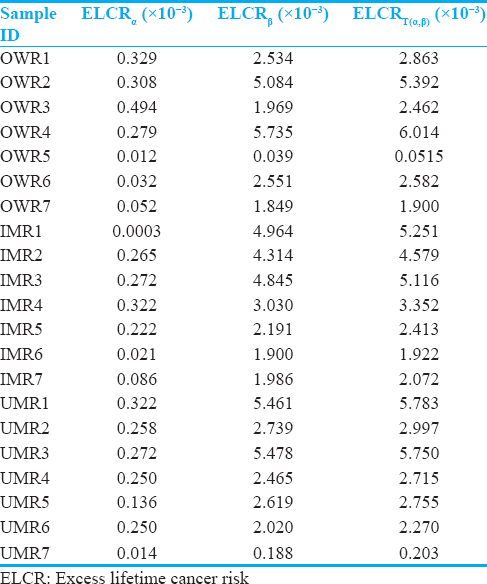 The Figure shows that the maximum values of ELCR T(α,β) which correspond to OWR4, IMR1, and UMR1, and their mean values are higher than the world average. The ranges of the mean of radiological risk parameters in water samples for the three surveyed rivers computed at 95% CI presented above tell us what the range of the true mean ought to be to reduce the level of uncertainty of the calculated mean which was based on a relatively small sample size (n = 7) for each of the surveyed areas. This range gives us an idea of the margin of error involved in using our small sample size to compute the mean of the sample distribution. The linear regression models of [Figure 5], [Figure 6], [Figure 7] are used to compare the relationship between the alpha and beta rays computed for the sampled points. The R2 (determination coefficient) values for the three linear regression plots are all <0.5 implying a weak correlation between the two radiating particles. Since there is a weak correlation between the trend of emissions of alpha and beta radiations from the surveyed sources, it is recommended that one computes independently the radiological risk parameters associated with the alpha and beta rays to ascertain their total radiological contributions. Three radiological risk parameters (due to the sum of gross alpha and beta radiations) have been computed for water samples collected from three rivers around some selected oil producing areas of Abia State. All the computed radiological risk parameters except two sampled points are above the world average limits and the WHO permissible limit for ingested water (0.1 mSv/y). Drinking water from these surveyed sources could impact negatively on the health status of the end users. It is therefore very important that during radiological studies, apart from the assessment of the gamma rays, the impact of alpha and beta rays should also be understudied because of their relatively high ionization potentials. All water bodies around oil producing areas should be radiologically screened periodically before consumption to ensure that they are not radiologically overburdened due to crude oil pollution. Iwetan CN, Fuwape IA, Arogunjo AM, Obor G. Assessment of activity concentration of radionuclides in sediment from oil producing communities of Delta State, Nigeria. J Environ Prot 2015;6:640-50. Ogundare FO, Adekoya OI. Gross alpha and beta radioactivity in surface soil and drinkable water around a steel processing facility. J Radiat Res Appl Sci 2015;8:411-7. Gür F, Yaprak G. Natural radionuclide emission from coal-fired power plants in the Southwestern of Turkey and the population exposure to external radiation in their vicinity. J Environ Sci Health A Tox Hazard Subst Environ Eng 2010;45:1900-8. Lu X, Li X, Yun P, Luo D, Wang L, Ren C, et al. Measurement of natural radioactivity and assessment of associated radiation hazards in soil around Baoji second coal-fired thermal power plant, China. Radiat Prot Dosimetry 2012;148:219-26. Mehade HM, Ali MI, Paul D, Haydar MA, Islam SM. Natural radioactivity and assessment of associated radiation hazards in soil and water samples collected from and around Barapukoria 2X125MW coal-fired thermal power plant, Dinajpur, Bangladesh. J Nucl Part Phys 2014;4:17-24. Karahan G, Ozturk N, Ahmet B. Natural radioactivity in various surface waters in Istanbul, Turkey. Water Resour 2000;24:4367-70. Abia Physical Setting. Available from: http://www.onlinenigeria.com. [Last retrieved on 2016 Aug 30]. Shell Free Online Library. The Free Library Gale Group, Thompson Corporation Company, Nigeria; 1999. Available from: http://www.thefreelibrary.com. [Last retrieved on 2011 Jan 05]. IAEA. Construction and Use of Calibration Facilities for Radiometric Field Equipment. International Atomic Energy Agency Technical Report 309; 1989. IN: 20 Model Technical Manual, Multiple Detector for Low Background Alpha and Beta Activities, Eurisys Mesures, France; 1991. ICIRP. Compendium of dose coefficient based on ICRP (International Commission on Radiological Protection) Publication 60. ICRP Publication 119. Ann ICRP 2012;41 Suppl 1:1-129. Mangset WE, Ike EE, Christopher LD, Solomon AO, Mallam SP. Evaluation of the radiation hazard indices and excess lifetime cancer risk due to natural radioactivity in ground water in mining areas of Plateau State. Int J Eng Appl Sci 2014;5:9-23. Ohio Environmental Protection Agency, Division of Drinking and Ground Waters. Radionuclides in Ohio's Ground Water, Technical Series on Ground Water Quality. July 2015. Available from: http://www epa.ohio.gov/ddagw [Last retrieved on 2016 Sep 27]. World Health Organization. Guidelines for Drinking Water Quality. Incorporating the First and Second Addenda. 3 rd ed., Vol. 1 Recommendations. WHO Press, Geneva, Switzerland; 2008. Xinwei L, Lingqing W, Xiaodan J. Radiometric analysis of Chinese commercial granites. J Radioanal Nucl Chem 2006;267:669-73. Taskin H, Karavus M, Ay P, Topuzoglu A, Hidiroglu S, Karahan G. Radionuclide concentrations in soil and lifetime cancer risk due to gamma radioactivity in Kirklareli, Turkey. J Environ Radioact 2009;100:49-53. Canadian Nuclear Safety Commission. Standards and Guidelines for Tritium in Drinking Water; 2008. Available from: http://www.nuclearsafety.gc.ca. [Last retrieved on 2016 Sep 20]. Preston RJ. Radiation Effects, ICRP Symposium on the International System of Radiological Protection October 24-26, 2011 - Bethesda, MD, USA; 2011. Available from: http://www.icrp.org/docs/Julian. [Last retrieved on 2016 Apr 15].